How To Clean A Skimmer Basket? 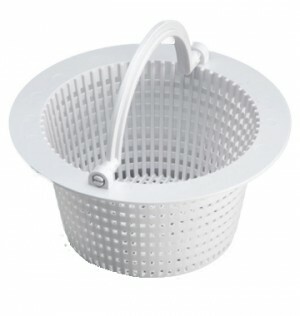 The Skimmer basket is one of the best parts of the filter system. It is a piece of plastic that has many holes and is shaped like the inside of your skimmer. The Problem is that every time that the basket gets full you will have to empty it. If you do not empty your skimmer basket then you could cause damage to the swimming pool pump. 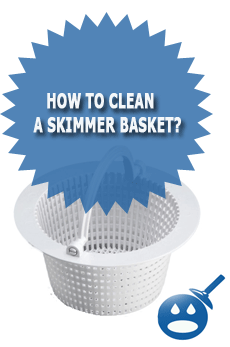 Cleaning your swimming pool skimmer basket can be easy and only take a few minutes if you do it the right way. There is also a few things that you may want to look for when doing so. Preforming a visual inspection of the skimmer and the skimmer basket every time that you empty it is also very important. If your skimmer basket gets cracked or has a hole in it, then you also could cause damage to the pump and / or filter system. The best way to prevent any damage to your pool system is to clean the skimmer basket on a weekly basis as well as other times that it may need it. Some of those “other” times could be after a storm for example, where there might be a bunch of fallen leaves inside of the pool. When your pool filter system turns on, all those leaves from the storm will get sucked into your skimmers and then start to create suction problems for the pump. So this is just one example of why you not only should clean your skimmer baskets on a set weekly schedule but also when needed as well. What you will want to do to clean your skimmer basket is to first get a bag or small waste pail, so that you will have something to dump the debris from the skimmer into. Once you have something you will want to walk over to the pool and locate the skimmers. If you have an above ground swimming pool you should only have one pool skimmer unless you have a super custom pool. If you have an in-ground swimming pool, you could have anywhere from one skimmer up to as many as 8 skimmers in your pool. You will have to clean each one, no matter how many you do actually have and they all will be cleaned the same way. Once you have walked over to the swimming pool and you are near the first skimmer you are going to clean you will want to remove the skimmer lid. If you have trouble removing the lid you will first want to make sure it is not screwed now and second you may just want to tap it a bit with a rubber malet as t he sun or t he temperature might have swelled up the cover. After you remove the cover to the skimmer you will see the skimmer basket. You can grab the handle on the skimmer basket pulling it straight up and you can then dump whatever is in it, into your waste bag or container. While you have the skimmer basket out, do a inspection of the basket to make sure it is not cracked. Now that the skimmer is clean you can stick the basket back into the skimmer the same way that you took it out. You will want to clean all of your skimmer baskets the same way. You will also want to inspect all the other baskets as well for cracks and damage. If you do find a basket that is broken you always can just replace it by going to the local swimming pool supply store. What Is A Skimmer Basket? 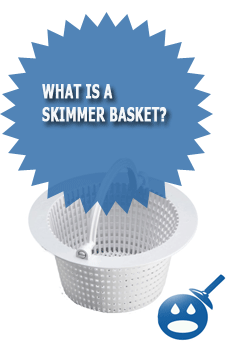 « What Is A Skimmer Basket?